For the past couple of years, I've paid attention to the literature program that James Stobaugh has put together for jr. and sr. high school. We've never used it, but it is something I keep coming back to examine. So when I found out we had an opportunity to review his high school history program you better believe we jumped at the chance. For the past couple of months, Connor has been using World History: Observations and Assessments from Creation to Today, and he really enjoys it. 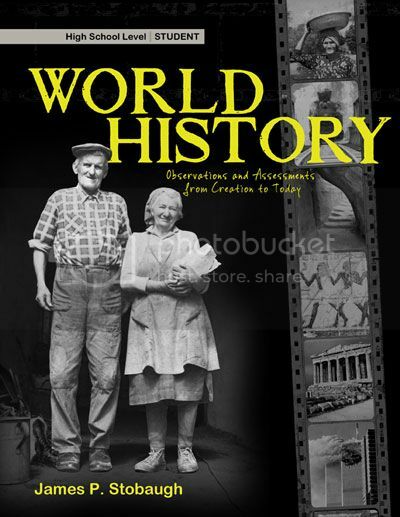 This 288-page student resource should be used in conjunction with the World History: Observations & Assessments from Creation to Today for the Teacher. American History and British History are included in this comprehensive high school history curriculum for 10th, 11th, and 12th grades offered by Dr. James Stobaugh and Master Books. We have both the student and teacher book, available for $25 and $15 respectively. The book is set up with 34 chapters, each consisting of a bit of introduction, four daily lessons, and a weekly exam. The lessons contain a short reading, and some type of critical thinking questions. The first chapter covers Mesopotamia, and from there the student works through history in a roughly chronological manner, ending with chapter 34 on South Africa. While the majority of the book covers typical western-focused history, there are also individual chapters on Japan, South Asia, Persia, China, Germany, Scandinavia, and of course, that final chapter on South Africa. Virgil -- includes a couple of paragraphs about Virgil, a mosaic dating to the third century, and a painting "Aeneas Flees Burning Troy." The daily assignment has the student thinking about who might serve as a "Vergil" today. Epicureanism and Stoicism -- this lesson includes a lot more text explaining both philosophies and quoting from Principal Doctrines, and from Meditations by Marcus Aurelius. The assignment includes a couple questions regarding these life philosophies. Neo-Platonism -- this lesson includes text describing Neo-Platonism and a passage from The Six Anneads by Plotinus. The assignment involves thinking about modern religions and philosophies that compete with Christianity. The Fall of Rome -- the final lesson is describing the fall of Rome and discusses some thoughts on the reason for the collapse. The assignment has the student describing the causes of the fall of the Roman Empire. In addition to the above lessons, the student book contains a glossary, bibiliography, and timeline. It does NOT include the weekly exams. The Teacher Book is half the size -- 144 pages. This consists primarily of each lesson's assignment and answers, including the exam key for each week. It also contains the exams and a weblink so you can print them off individually. The exam for Chapter 13 includes a dozen matching questions and an essay question. Now, after we got started with this, we became aware that the suggested sequence for Stobaugh's materials has you using this book for 12th grade. Connor was finishing up 9th grade when we began the book, so he is a couple years younger than the intended audience. I have some concerns about this book being used as the sole source for a high school history credit. Initially, I thought I probably just have a warped sense of how much work you need for a credit. But after reading through the material a bit more and crunching numbers, I do think this is just not enough. It is suggested that each lesson should take 20-30 minutes... which would be 1.7-2.5 hours a week. Over the course of 34 weeks, that is 58-85 hours, and I just don't think that is enough time spent for a full history credit. That makes me feel better though, as this means that I can add some additional reading to his life and I don't have to feel like a demanding mom. So we can add a biography every couple of weeks, or a documentary, or additional research. We are enjoying this study, and finding the questions in the assignments are leading to a lot of interesting discussions. Like any history program, I question why an event or person wasn't included quite frequently, however we are free to add a little something here or there. And given that this is covering a few thousand years in 34 weeks, clearly many topics simply cannot be covered. There seems to be a "slant" towards including events/concepts that still impact us today. Like most first printings of texts, this definitely has a few errors. Hopefully we have done a decent job of catching them as we go. All black & white, which does keep the cost down. We'd rather look up artwork or whatever online than pay more for the book. The size of the book makes it really easy to take along and continue to just get it done. It isn't a huge, intimidating textbook. Sometimes dates given are pretty exact, even when I know from other reading that there is a fair amount of debate for an event. Sometimes, there is discussion about some of the various dates/date ranges. Heavier emphasis on ancient history, with modern history being a bit more rushed. Lesson 20 is on the Middle Ages, so well over half the book (19 of 34 lessons) takes place before the Middle Ages. Given that the other two books in this series are British History and American History, and those two volume focus on more recent history, I can understand the choices. My overall opinion? We are using this as a spine for high school history for Connor anyway. I require him to log more time before I will give a full credit.